One of the most important shifts in schools in the last two decades has been the growing emphasis on collaboration among teachers and other educators. 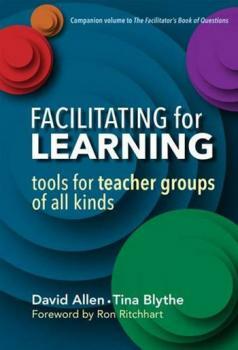 Whether you are a teacher facilitating a group for the first time or an experienced facilitator seeking to further develop your skills, this book is for you. Organized to be used as both an exploration of the role of facilitating and as a handbook of strategies, this resource covers a range of contexts that include faculty meetings, department meetings, professional learning communities, grade-level teams, and inquiry groups. This book is a perfect companion to the authors' bestseller, The Facilitator's Book of Questions, which focuses on the skills needed to facilitate protocols or structured conversations. Facilitating for Learning extends the scope of that work by also examining the facilitator's responsibilities for supporting a group's learning during all parts of a meeting, between meetings, and within the larger school context and culture. It is an essential resource for teachers, administrators, coaches, and teacher educators.